So Much Fun with Wummelbox! We received a Wummelbox for the purpose of this review, no monetary compensation was received. All opinions are my own. We recently received a Wummelbox to review... and I am in LOVE. 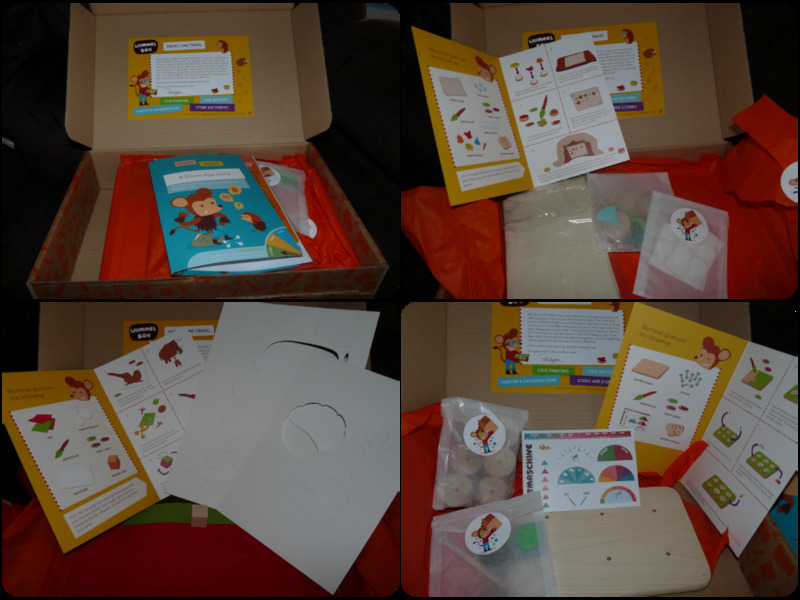 The Wummelbox is a monthly box that is delivered to your door and contains three amazing projects for you child (3-8 years old) and you to create! The Wummelbox, a European-style arts & crafts subscription service for kids, is designed to inspire creativity and exploration. Wummelbox provides families with all the materials needed for hours of hands-on fun all in one box. Each box is based on a particular theme (such as Nutrition, Music, or Color and Light) and includes everything you need, plus instructions! Each project promotes creativity and supports a range of developmental skills such as feelings, senses, language, thinking and movement/motor skills and all activities are designed and tested by early childhood educators designers and parents. Plus all the Wummelbox materials meet the highest European and U.S. standards for toys. Wummelbox not only focuses on high wuality materials, it also takes the extra step to be eco-friendly when possible! We received the Time Travel Wummelbox for review. At first, I thought the box was rather small... how did it fit 3-4 projects in it? Well, no worries, it did...and I was amazed! Sure enough, nicely wrapped individually in tissue paper, there were three projects. We got to travel back to the stone age and have some fun by creating our own cave paintings! There is also a hunter and gatherer game to create, and we will build our own time machine! The Wummelbox subscriptions are available in three lengths. For one month subscription (great if you just want to try this out) it is $34.95. For a three month subscription you can subscribe at $24.95 a month...or if you are a big fan and want a whole year each box will only cost $19.95! I am definitely saving some money to get an entire year subscription, I was so impressed with the quality of the Wummelbox contents (and the fun that we had) that we will be purchasing more! i like that its for up to 8 years old- love these boxes but it seems like most are geared toward preschoolers or toddlers and my soon to be 8 year old LOVES crafts and projects! This would be so cute for my step daughter's son! He's just a little dude and this is perfect for his age. I was wondering what to get him for his birthday this year, and this might fit the bill!! I love this thanks for sharing! I've had a few others come here but they are mostly for toddlers. For sure checking this box out, will make for a fun summer activity! Looks like a cool program. I bet my son would love the crafts! My toddler would love this! I'll have to check it out! Always on the lookout for good rainy day activities for the kids. Especially educational stuff! Thanks! I've never heard of Wummelbox, my kids would love this! Thanks for sharing. Spring Forward with Scotts Florida Select Mulch!